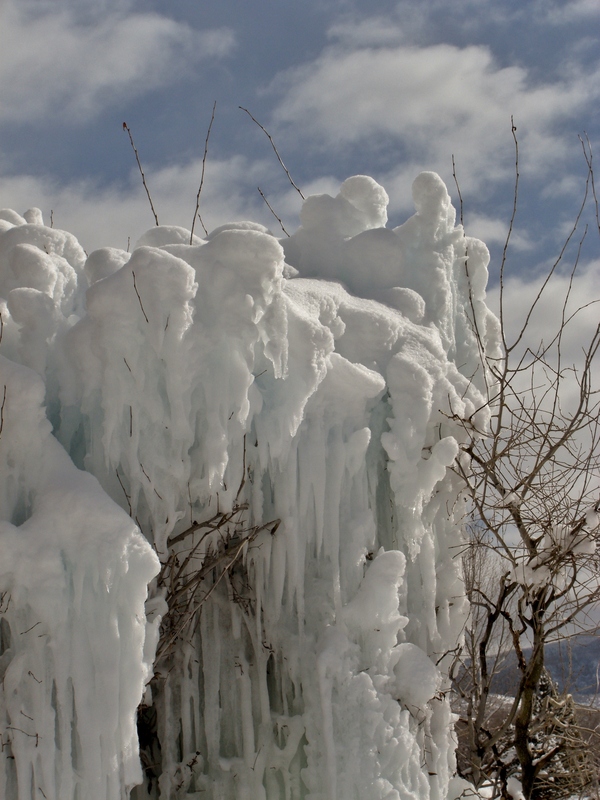 The Ice Palace stood proud between January’s Wolf Moon and the Snow Moon of February. 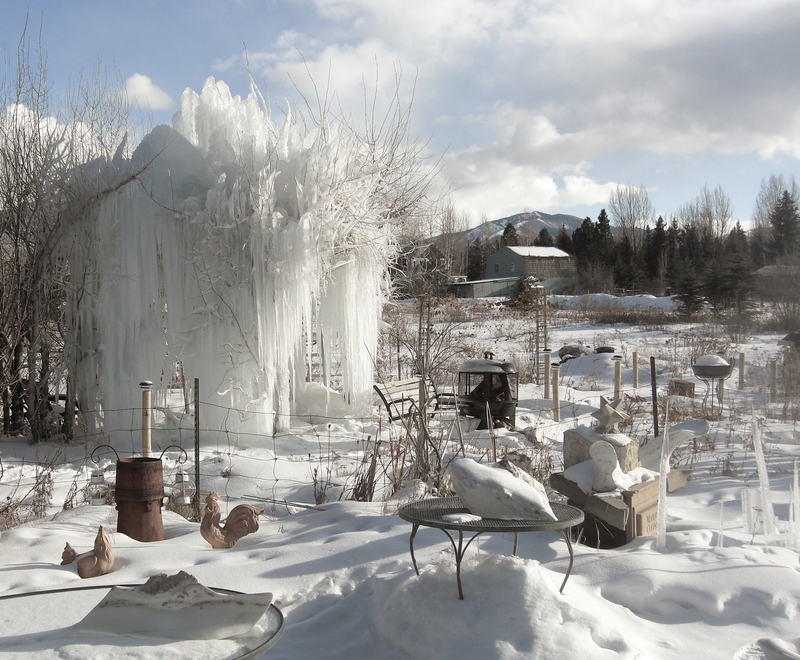 I first made plans for the Ice Palace as I worked on The Arbor over the previous summer, although I will readily admit I had no idea just how it would turn out – but I had already entered an alliance with nature and the lessons I learned as I carved The Maiden Collection served me well as I set the parameters and simply let Mother Nature get on with it. And so begins ‘The Camelot Era’, one of the many phases The Ice Palace would undergo. 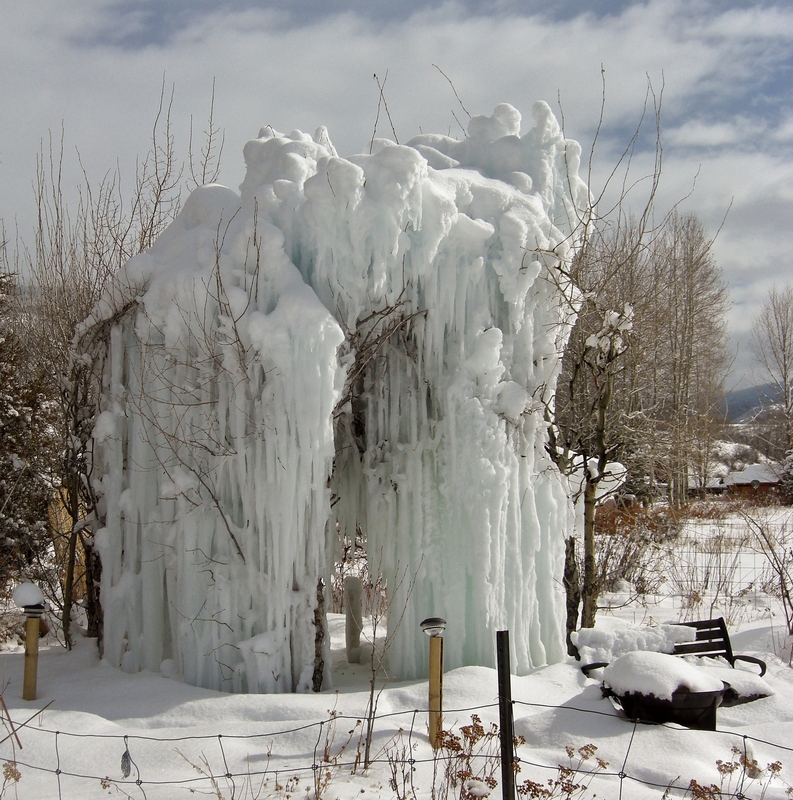 During the entire time The Ice Palace graced the Colorado Rocky Mountain English Country Sculpture Garden I did not interfere with the process in any way, shape or form. Everything you see is a result of temperature, the wind, the sun, the cold and the heat. My job was to simply add water and stare! 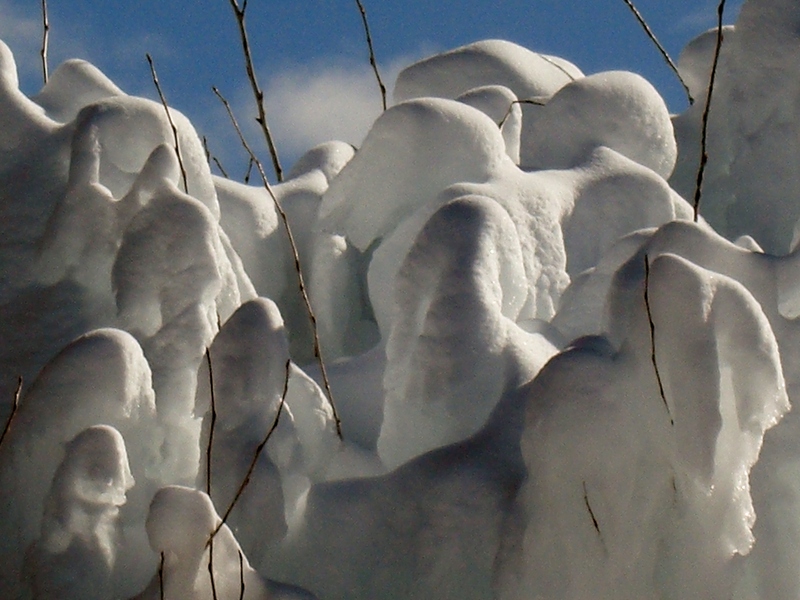 The Snow Creatures mingle about as they explore their new home. Nothing could really have prepared me for the results, and to this day I have no idea just how, or why, they formed the way they did. However I can assure you my role wasn’t simply to point a hose and retire… there were nights when I thought I was going to catch my death of cold, but without spilling some very hard won trade secrets the direction and volume of water, combined with factors such as the shifting wind, created the Ice Palace you see before you, and I did not so much as lay one finger on it (except to give it an admiring pat from time to time to assess the strength of the ice). It was to stand for the designated month between January’s Wolf Moon and the Snow Moon of February, and well beyond. The Pirate and his Loyal Monkey scan the horizon. Tune in for February’s installment when Sculpture Garden Magical History Tour takes you through the calendar, when the bizarre becomes by degrees, spectacularly bizarre… right up until the dignified, and impressive, dramatic final curtain. Elky readies himself for the impending storm. There is nothing much to disturb the tranquil scene. 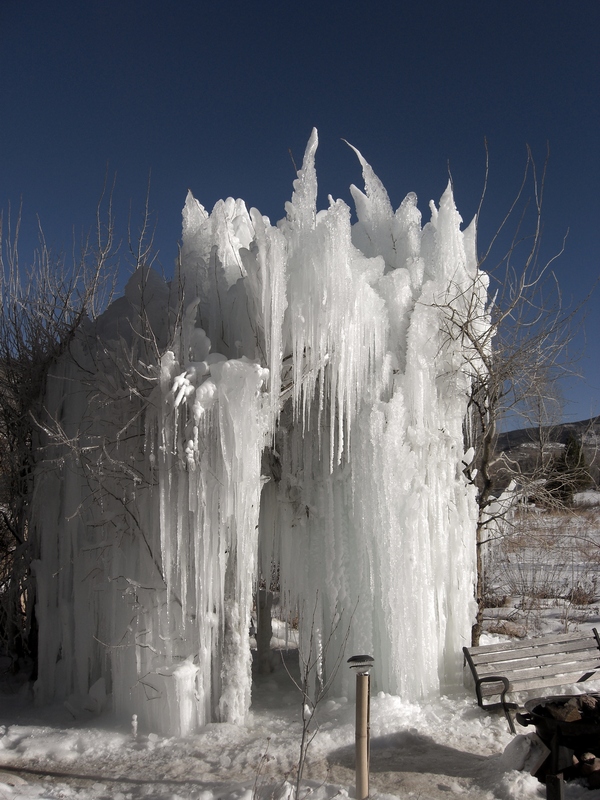 This entry was posted in All Postings, Posts about My Daily Life, Posts about the Ice Palace, Posts about the Sculpture Garden, Posts with Sculpture Garden Tours and tagged Posts about the Ice Palace, Woody Creek. Bookmark the permalink.